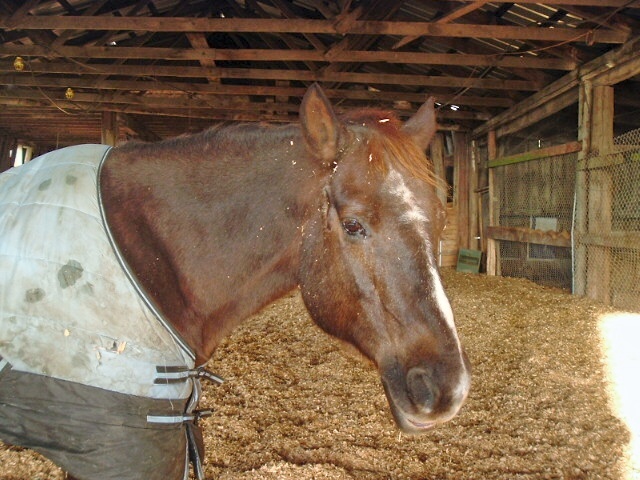 This is a pic of Skippy, my old quarter horse mare. Not your ordinary horse, but that is another story or better yet another blog post. I had received her mother, Poco for a birthday gift years ago and imagine my surprise when I found out she was in foal. Shortly after Skippy was born. Skippy - without the blackberry branch! She loved to eat as most horses do and she had a five acre field to wonder around in and eat as she chose, coming back to the barn every morning and night for her feed and hay. I had noticed that she was off her feed and just was just not her usual self. The red flag went up,and she was stalled till I could find out what was going on. Right away I did an intuitive scan of her body and was halted right at her throatlatch area. I could “see” a blockage and could sense pain so I called the vet right away. He came and brought out his scope which he could easily insert down her throat so he could view what was the problem. He gasped and said a few words that won’t appear here and said “take a look.” I brought the hard black scope up to my eye and there I could clearly see a blackberry branch that was lodged in her throat. Poor Skippy, no wonder she was in pain. An intuitive scan helped to identify her problem area and the vet was able to quickly respond. Because of my small arms I was able to get them down her throat. Yes, after she was sedated. I carefully grabbed the branch in a finely gloved hand and removed it. She was sore for a day or two but quickly got back to her happy self. Special note that I do these scans from a disance often more effectivley than in person as I have no distractions.